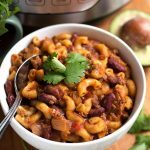 Instant Pot Chili Mac is a great one-pot meal that is filling and tasty. With the option of Cheesy Chili Mac, it will feed the whole family! 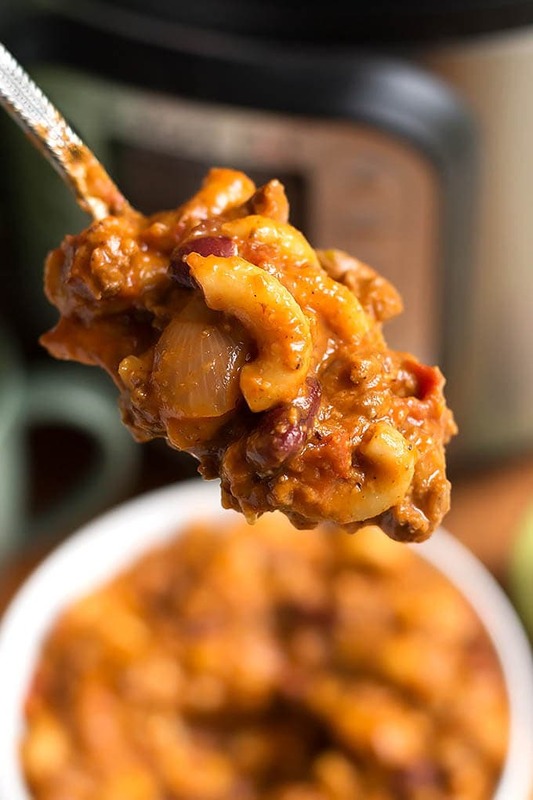 This pressure cooker chili mac is made with easy to find ingredients and is delicious! Today was super busy. I decided to make a video showing how to make my Instant Pot Pumpkin Cheesecake. There is a bit or preparation, as several of the ingredients need to be at room temperature. So I was all ready to push the record button when the next door neighbors started up a JACKHAMMER! It was so funny because every time I thought they were finished, and I started talking, the jackhammer would start up again! And that thing was loud! Our houses are very close together, so it sounded like it was in our back yard! I just laughed, and was happy that no one was here to see that! Our neighbors are wonderful, and they are having their yard re-landscaped, so there will be noise! No big deal! 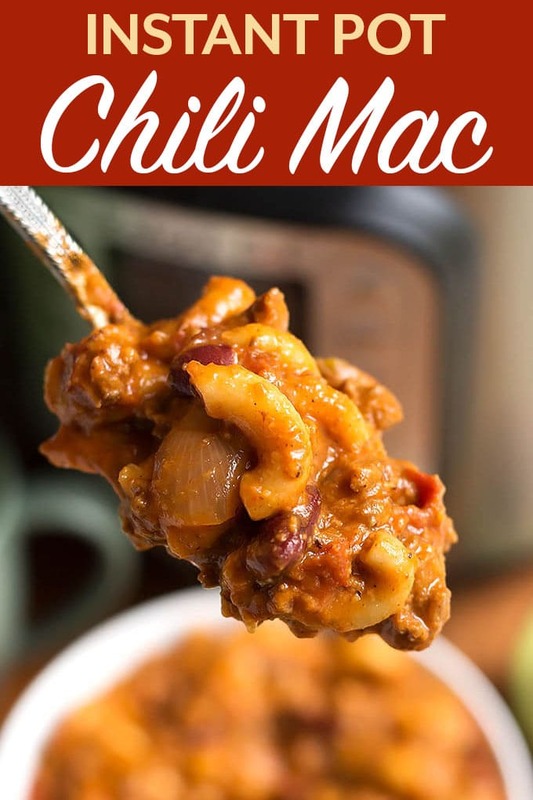 With the day being so busy, we are going to have this Instant Pot Chili Mac for dinner tonight. So easy. I opted for the cheesy version. Yum! This is the Cheesy version. 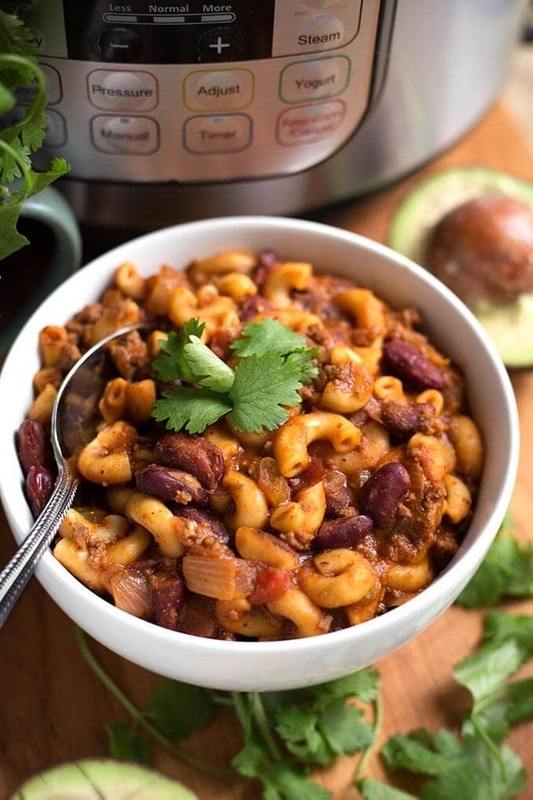 Instant Pot Chili Mac is a hearty and filling blend of chili and macaroni. It has lots of flavor and is a great family dinner, or a Game Day meal! Add onion, bay leaf, and celery. Sauté until almost translucent, stirring occasionally. Make sure to scrape up any brown bits on the bottom of the pot (deglaze). *Cook time does not include the time the pot takes to come to pressure. It could take 10-15 minutes as the pot will be pretty full. Our family loved the recipe and it made plenty of leftovers! I know if I still had kids at home they’d love it too! I’m so glad you and your family liked it! Thank you for your nice comment, Linda! Can’t wait to try this. I usually make a chili mac that I dehydrate and take on hiking trips, but for my next trip I’ll try yours…it looks delicious! Hi Jaxx, that sounds amazing, to dehydrate the Chili Mac! I’ve only dehydrated fruits and such. I hope you like my version! Thank you for the comment! How do you dehydrate it? I would love to do this. Thank you. We dehydrate chili all the time for backpacking. It’s easy to do “regular” meals in a dehydrator, just make it a “thick” version of the food then use the fruit leather trays for the dehydrating. Smooth out the food using a spatula and turn on the dehydrator. Warning: It’ll take quite a bit of time (you know it’s done when you squeeze/bend the resulting leather/chunks in the middle and no moisture comes out) and it *smells* like dinner cooking the entire time! Keep track of the serving size you put on the tray so you’ll know how many servings you have. If you’re using it pretty soon, simple storage in ZipLoc bags works fine and packs easily in a backpack. I’m not thinking the “cheesy” version of this recipe would be so good for dehydrating due to the high cheese/dairy content (too greasy). I have done beef stroganoff, though, but the sour cream content means that it doesn’t “keep” as long in the cupboard before we head out on a hike. Hi Tonya! Great tips, thank you. This is really interesting! Waaaay back in the day my dad gave us a dehydrator for a wedding gift. May have to try this! This is delicious! I did use a can of chili beans but didn’t change anything other than that. Hi Cathy! I’m glad you liked it! Thank you for taking the time to leave a comment! This was outstanding! I used the cayenne pepper for more spice and only because I didn’t have any beans they were omitted. I will be making this again! I also doubled it in my 8 quart PC. Hi Jeanette! Thank you for the great review! I’m happy that you liked this Chili Mac! Very good recipe. Made for wife and I. We knew we would have left overs and adding cheese mixed in would have made it like a brick after refrigerating. We just sprinkled graded cheese on top of our servings which worked great. Thanks for sharing! Hi Mike, I’m glad you and your wife enjoyed this! Adding the cheese later was a great work around. Thanks for the review! LOVED this recipe and it made so much! I will have lunch for a week! I added a fresh seeded jalapeno instead of the canned chilies, beef broth and also used tomato paste instead of tomato sauce. Super easy and fast. Thank you for sharing! Hi Kristina, I’m so glad you liked this chili mac recipe! Thank you for your review! This was the best chili mac that I have ever made. Totally loved it. Will add it to my board of meals to make again!! THANK YOU!!! Awesome! Thank you for letting me know, and for your review! Yes, I use a 6 qt for this recipe! I’ve made this several times and felt I should finally leave a “thank you” comment! Hubby, kids and grandkids love it! That’s really nice, Kim! And thank YOU, too! This too looks amazing! We don’t eat meat, so I would use meat alternative (Mexican flavor) Smart Ground by Lite Life. Since it’s ready to eat, would you still recommend sautéing with onion, or adding after onion is translucent? I would cook the onion first, then add in the Smart Ground and proceed. I had this at a friends house and it was amazing. I made it and it was just as good. Great recipe and tips to keep your meal from burning in to pot. Love this recipe! I couldn’t find my cayenne (I know it’s around here somewhere) but had an extra jalapeño from another recipe, so I diced it and tossed it in with the onion with a little scraping of the seeds for some heat. It is really good; even my 11 year old is eating it and she doesn’t like things like this normally. Since most of this pot is going to some friends (the cook in the family left for a week) I will have to make another pot pronto! Hi Elisha, that’s awesome! Thank you for your review! I’m so glad you and your daughter like this chili mac recipe!